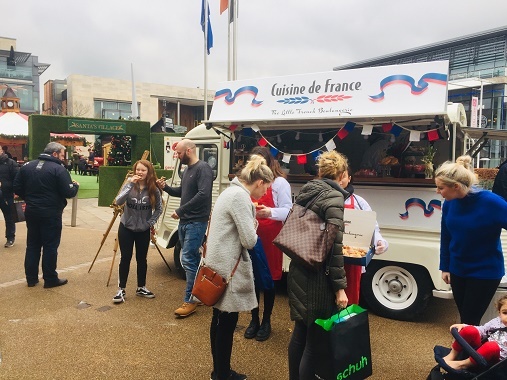 The new range of Cuisine de France Christmas bakery treats went down a storm with shoppers who were out in force in Dundrum Town Centre on Saturday. On a chilly day, our team had samples of our classic puff pastry mince pie, our luxury trifle muffin, our rich and indulgent cinnamon pastry and of course, the hugely popular ‘Pastel de Nata’ Portuguese-style shortbread custard tart. Everybody we met, young and old alike, really enjoyed the treats! If you missed us at Dundrum Town Centre, the good news is that we will be out again with treats for everyone this Saturday (01/12/18) at Blanchardstown Shopping Centre. Make sure you come and say Bonjour! To order your stock of festive bakery treats, speak to your ARYZTA Business Developer, or call us today on 1850 777 000.